Tactics Without Strategy Equals Business Failure - Profitkoach on Why You Need Marketing Objectives? Handling sales objections during the sales process is a challenge most business owners need to meet and turn to their advantage. Just how do you turn a ‘no’ into a ‘yes’ in a sale? Well for a start you should welcome objections and treat them as valuable feedback on your offerings. In learning how to overcome objections you must take the perspective of an interested observer by not taking objections personally. Objections can be flipped around and worked on to become effective responses in your sales process that neutralize resistance. List each of the most common objections you receive from your prospects and turn each one into a “Frequently Asked Question” (FAQ) within your marketing materials and sales scripts. 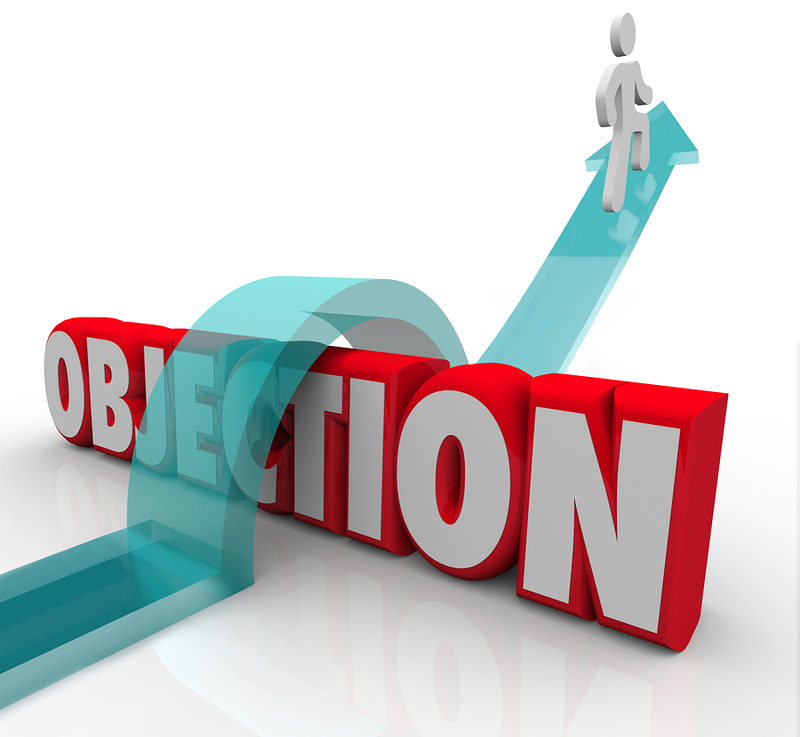 The following objections are often encountered by business owners and sales staff. Review them and use the objection to formulate your response. Start with your top 3 objections and turn them into FAQs. Present your product as complementary to their current solution, or change their perspective by showing them that it is uniquely different. It’s all a matter of changing the customer’s perspective. Put forward that you are offering to be a dependable fall back in case their primary supplier is unable to serve their needs. If accepted, it allows you to keep up the contact and build the relationship. Get them to look at the wider viewpoint. Find out what it is that they require. Relate with the customer and present them with the opportunities that your product will create, and how it will generate a business return for them. Again, the strategy here is to obtain permission to maintain contact and build rapport by adding value when needed. Sometimes this response is because the prospect is not educated in what you offer or the benefits for them. They may be at the very early stages of the the sales cycle (unaware of a need or alternatives). Find out more about what the customer is looking at, and what their interest is. Ask questions and build rapport, then make your pitch to show him how well your product matches with what he requires. Offer them information that gives them new ideas and gets them asking you questions. Break down your product’s pricing into its components. Show how each is attached to different elements of the product. Let your customer know that your product will add value to their company in terms of benefits. Always have several price points and payment plans to offer. Case studies of similar businesses you have dealt with showing the return on investment you can produce, are compelling. A response of “its priced too high” can be because you have not differentiated your offering from your competitors. If your product or service is viewed as a commodity the conversation will always be about price. The client is complacent with the status quo and is uncomfortable with changing it. Mention other customers you have in the same line of business who are using your product. Describe the updated features available and how the changing marketplace requires that the client can and should use to be more competitive. Contrasting what their current status is, compared to the results they could enjoying, could reveal an opportunity that they may not have considered. You need to research and understand what your competitors are offering. Develop a matrix of benefits and features for your top three competitors and your product as well. In what way is your product superior to the market offerings? Here’s where you show the client your product’s benefits, and how it will translate to their advantage. Back it up with proof and your customers’ endorsements. If you’ve got a great client list, here’s where you start name-dropping. Show where your product scores above the competition (remember that features and benefits matrix?). Remember to highlight those benefits that you know your existing customers value. Also include those attributes that benefit the buyer personally. A buyer may be a purchasing officer. Your offering may include training, support or presentations to the business owner – which assists the purchasing officer their role. This is personal value and should be included in your FAQs list sent to the prospect prior to an appointment. As part of your data gathering during the sales process, you would be asking who is involved in the purchasing process. Understanding the purchasing process allows you to request that the main players attend your presentation. Set up a meeting with all the decision makers involved, to establish a rapport with them. Take time to find out what each person’s perceptions or objections are and deal with each of these. This response is because the person you are talking to does not have the authority to spend the money, or they are delaying the decision making process. If it is the former, then you need to better target your prospects. If it is the latter you may not have created a sense of urgency or not convinced them of your products value. Check to see when the client will be available to give you a short meeting. Lock in a future meeting and then drop that into your CRM. Ensure you periodically touch base with the prospect through a newsletter or references to information of interest. obviously it is not urgent for them to make a decision now…unless you have shown them how much the delay may be costing them. Find out whether the client has had a bad experience with a similar product or service. Mention how your product has worked for other customers and how it can benefit them. This is where case studies, testimonials and video demonstrations come in. Social proof should be used throughout your marketing and sales cycle. The case studies of similar businesses that show “before and after” results are effective and powerful tools. A trial of your product or service for a short period is also useful. This may be a valid response. If it is, then review your prospect targeting strategies. Otherwise you have not clearly established a need for your offering. A thorough understanding is required of the market, your prospects business and how your product adds value. Find out what the customer requires and what their perception of your product is. Provide case studies showing return on investment figures for your customers. This is compelling proof of your products application in similar businesses. Brian helps small business owners win back their time, passion and performance utilizing a proven step by step blueprint for success. A coach and consultant for over 10 years specializing in business growth strategies.